Located on the main road in Neah Bay, Washington is Makah Marina. Named after the native Makah Tribe, the Makah Marina is relatively new, built in 1997. Historically, the Makah Tribe was composed of five principal villages. The population of the Makah at the time was estimated to be between approximately 2,000 to 4,000 people. Currently, there are roughly 1,500 members of the tribe living in and around Neah Bay. 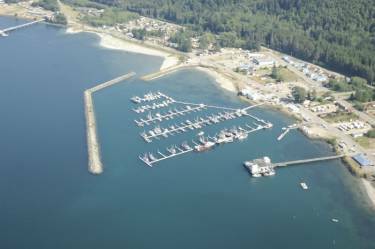 With sandy beaches stretching on both sides, Makah Marina provides both overnight and permanent moorage with 200 slips available for ships over 100 feet in length. The marina itself has a main dock where ships can refuel, restrooms for patrons, as well as showers for overnighters. Portland Bolt manufactures long rods with threads on each end, which are used to connect and fasten the floating docks used in marinas such as this. In the summer of 2018, a contractor had been hired to perform a rehabilitation project at the Makah Marina and contacted Portland Bolt to supply the required floating dock rods. The rods required were all ¾” in diameter and ranged from 99-1/2” to 162-1/2” in length. There were also headed anchor bolts needed meeting the ASTM F1554 Grade 36 specification. Because of the marine environment, all of the required fasteners were hot-dip galvanized, which was perfect since Portland Bolt hot-dip galvanizes in house. In total, the job ended up requiring approximately 400 rods weighing over 5,000 pounds.